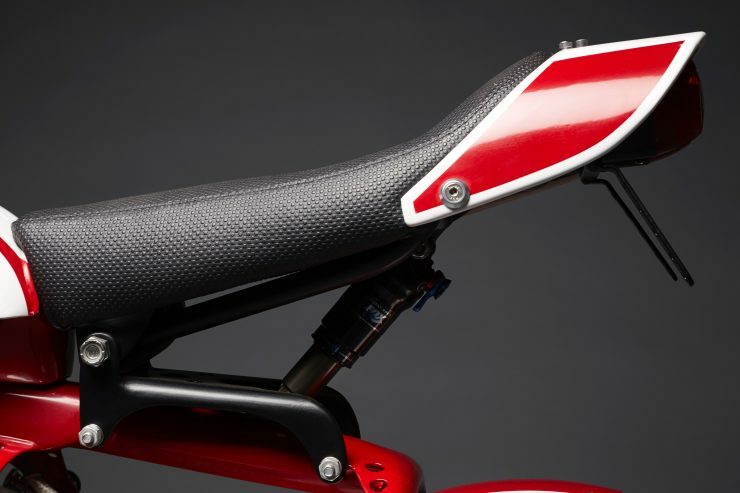 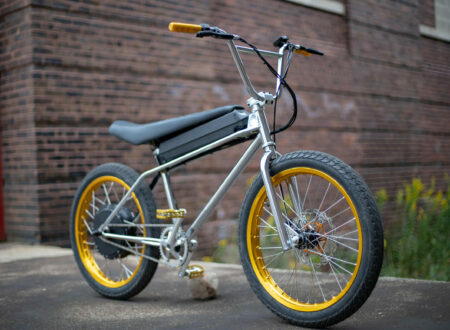 There’s something immediately approachable about mini bikes. 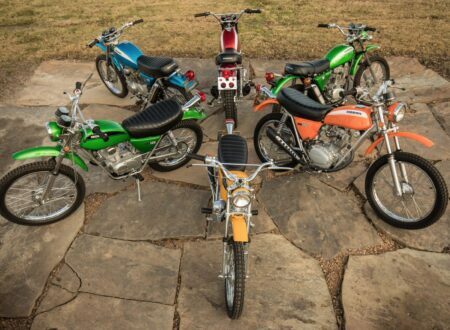 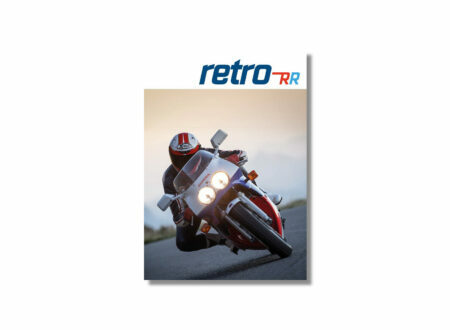 In fact they might be the only motorcycle genre that almost all motorcyclists like. 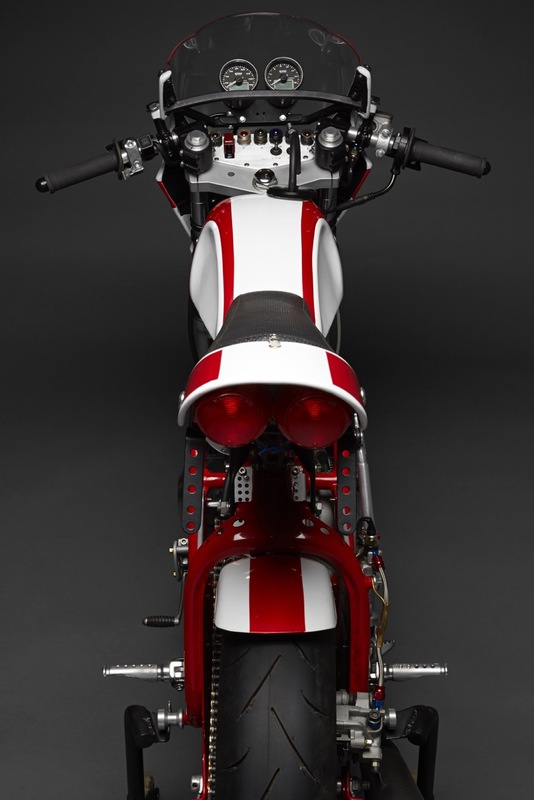 The mini racing bike you see here started life as a bare 1969 Z50A Magnum frame, it was sourced from a local legend in Denton, Texas nicknamed “Minibike George”. 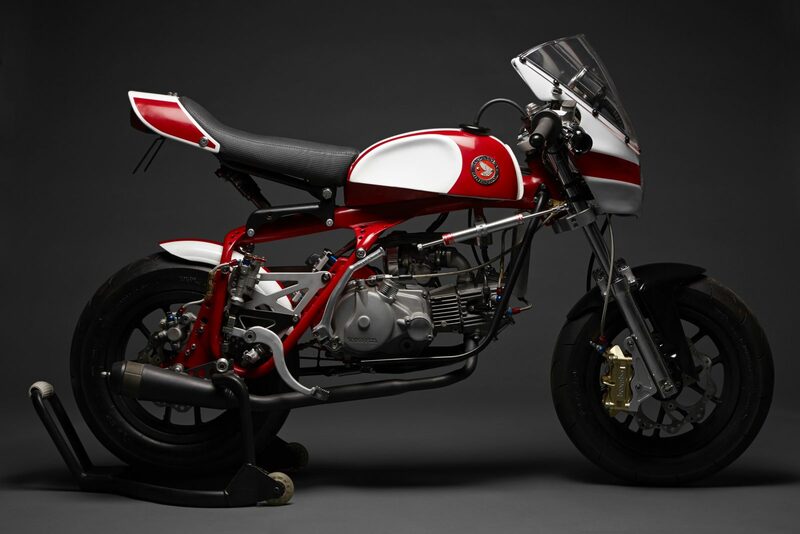 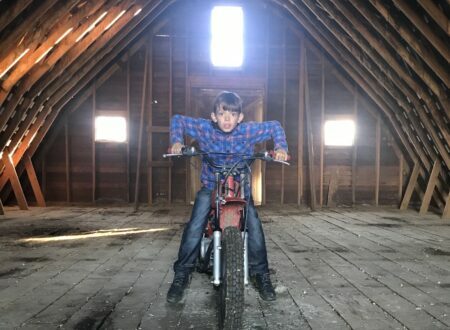 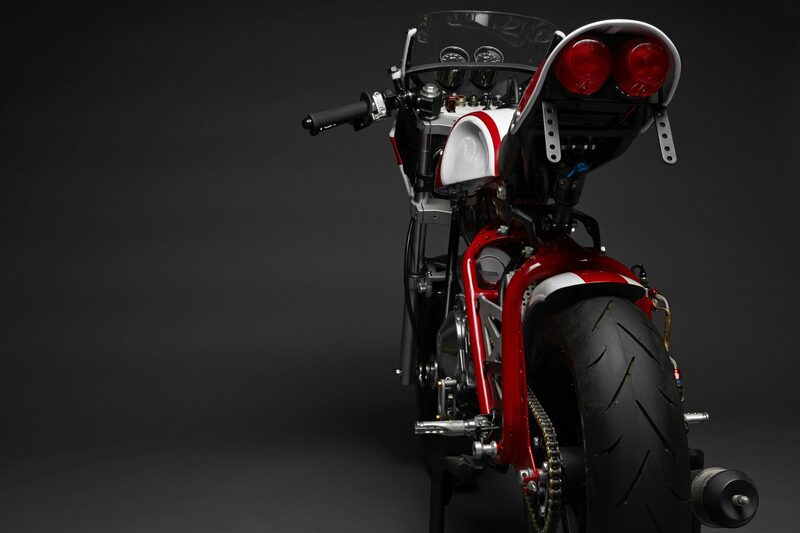 The build is the work of David Morales, a custom bike builder with a dozen years of experience under his belt – and many of his creations are mini bikes. 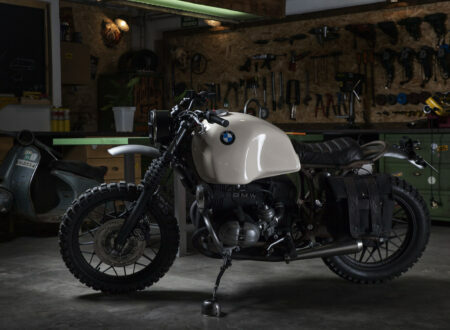 He’s based out of Denton Moto, a hub for the local motorcycle community providing repair services, gear, art, and accessories – as well as advice. The Magnum frame was in such poor condition that George refused payment for it, after it had been cleaned up it was stretched 4 inches longer, and 2 inches higher, with some additional gusseting added to common breakage points. 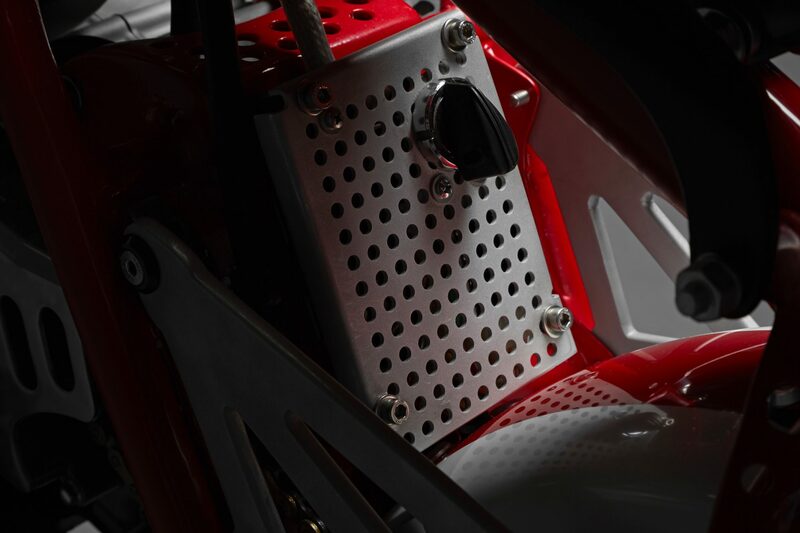 The original engine was long gone but this wasn’t a problem, as the plans for the build called for a much larger capacity motor than the original 49cc unit. 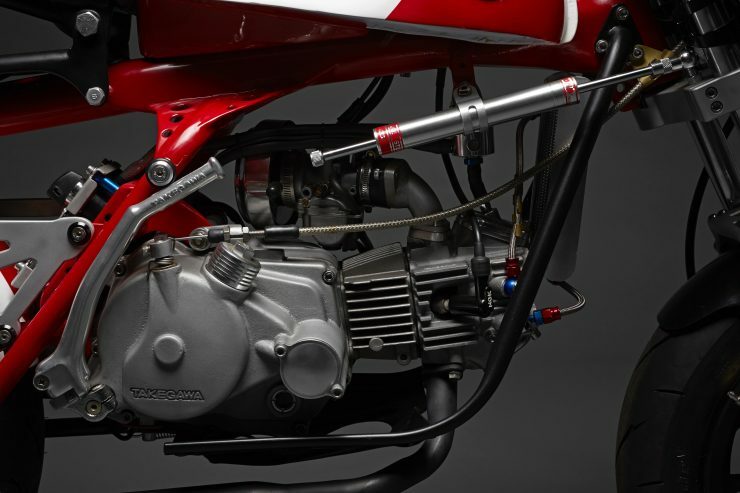 The engine chosen for the build started life as a Honda CRF50, but it was rebuilt and bored out, and fitted with a high-performance 4-valve Takegawa Superhead, a stroker crank (for 124cc capacity), a Takegawa Hyper ignition was installed and paired with a Kitaco Supercoil, and a Takegawa 5-speed gearbox with a high-performance clutch sends power to the rear wheel. 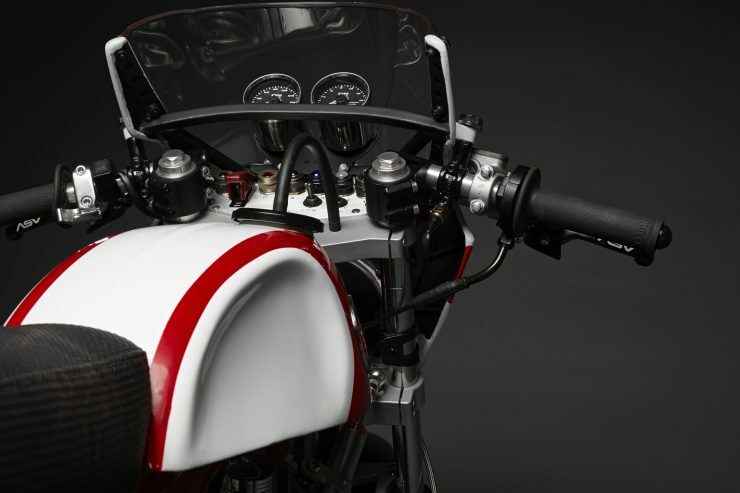 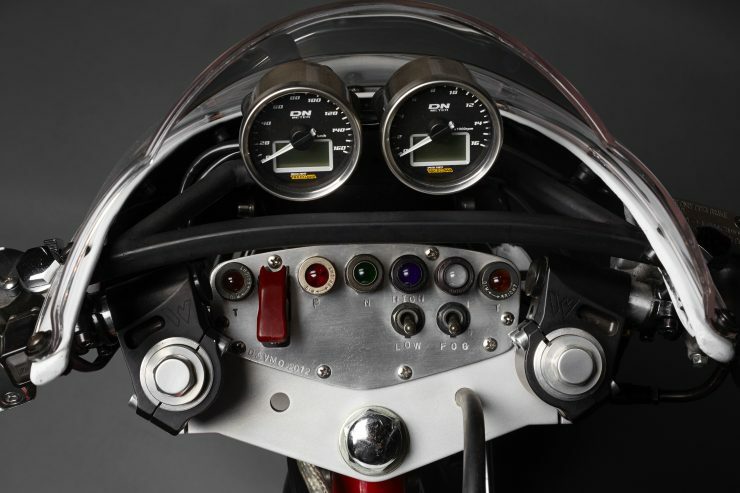 A Keihin 28mm carburettor was added up top with a chrome-plated air filter, and the exhaust was custom made, then fitted with a Supertrapp muffler. 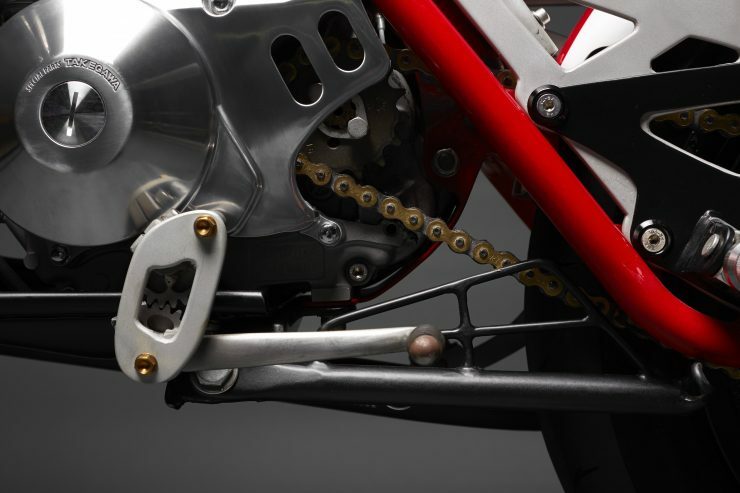 The original suspension was never going to be adequate for the new engine, so the forks were swapped out for a pair of more modern Honda NSR50 forks. 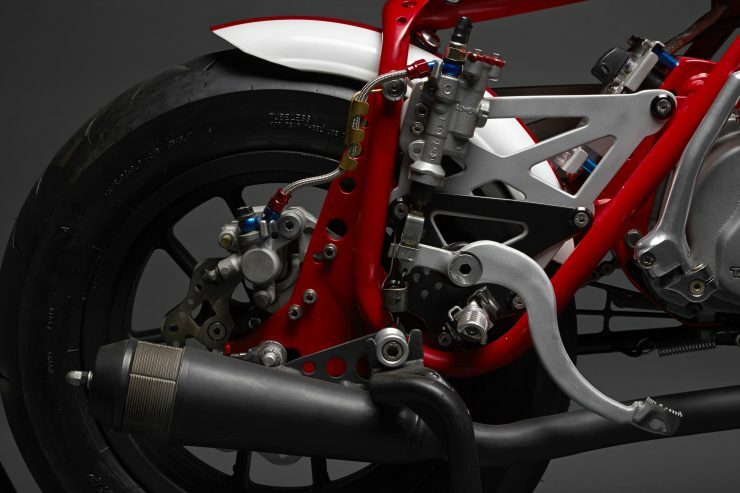 The Brembo 4-pot calliper on the front wheel is paired with a CRF450 master, and the wheels are Honda NSR50 replicas, shod in Dunlop TT92 tires. 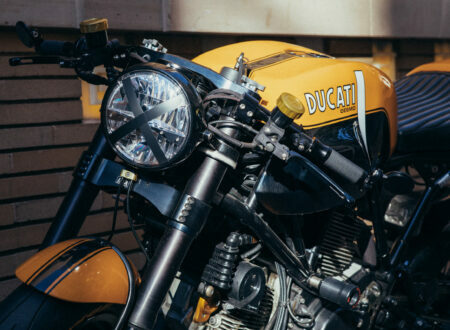 David made the front fairing from fibreglass after getting the shape right using a wire form, and he paired it with a Ducati visor. 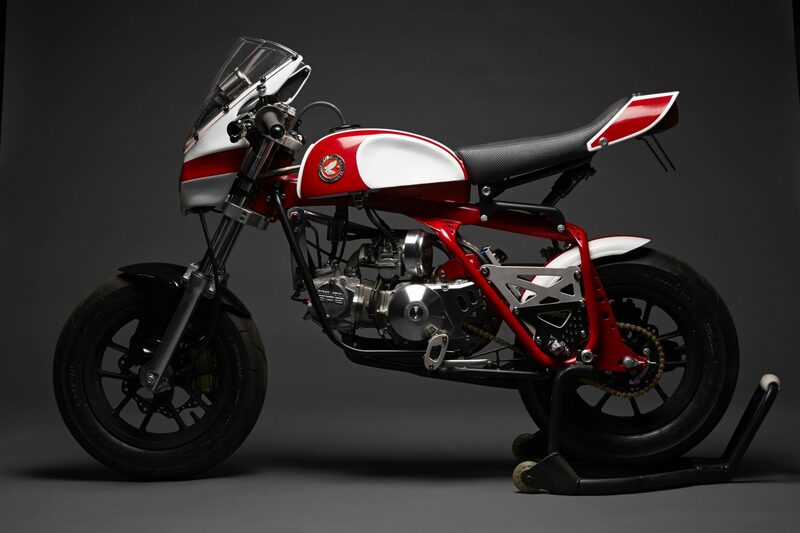 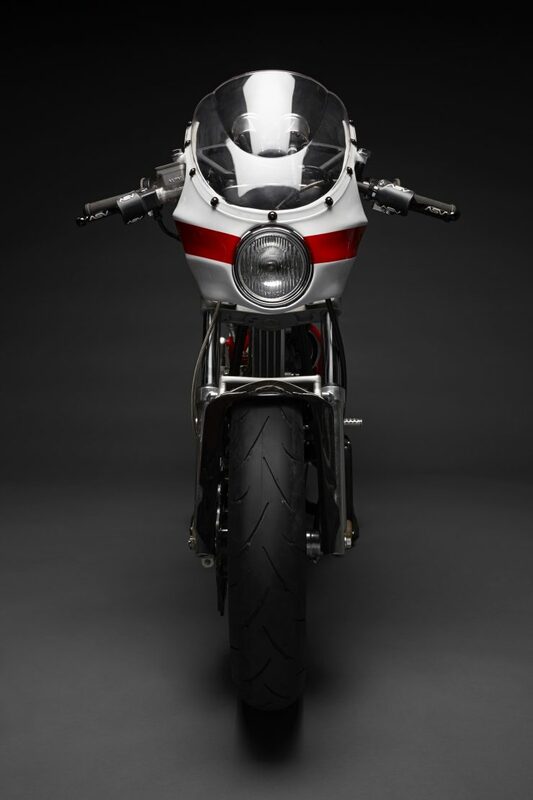 The finished bike is one of the quickest mini bikes in Texas, and it’s just the tip of the iceberg – If you’d like to see more of David’s work or commission your own custom build you can click here to find him on Instagram.